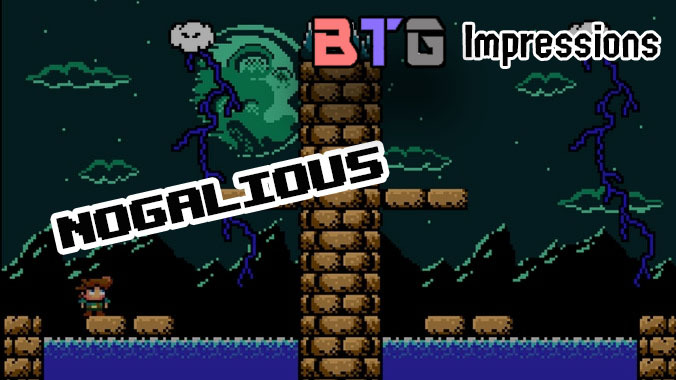 Nogalious is a challenging and short platform puzzler from LUEGOLU3GO STUDIOS. What did we think of the opening title of this trilogy? Free Product provided generously by LUEGOLU3GO STUDIOS! Nogalious is a game that captures the essence of challenging retro titles, injecting some light puzzle elements. This classic design can lead to a sometimes frustrating but equally rewarding experience. Nogalious proves to be a fun and challenging title. Nogalious captures the classic PC era of gaming perfectly. Nogalious is a very simple game. Objects are defined and the character stands out. 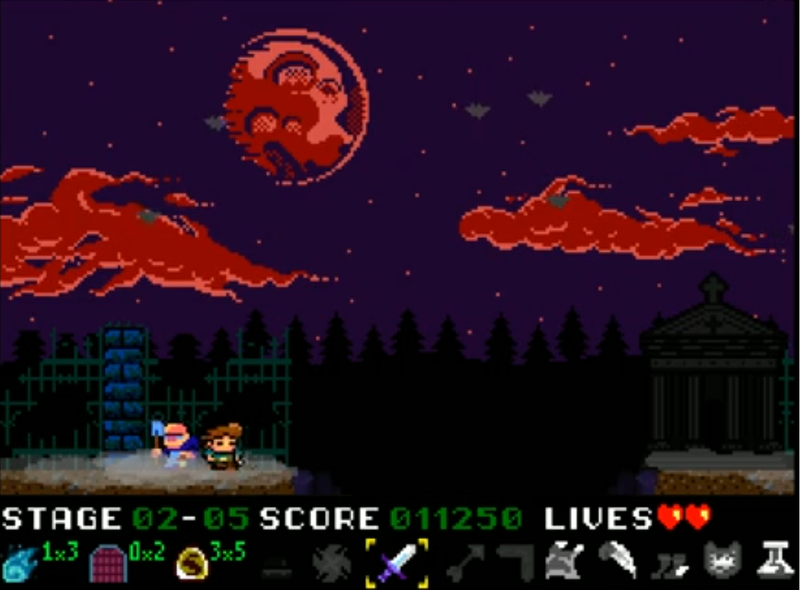 Enemies can at times blend in, red bats and red clouds for instance, but the aesthetic suits the game well. Items are often obvious, though at times can be obscured by the low-level of detail making it hard to see what you need to do. 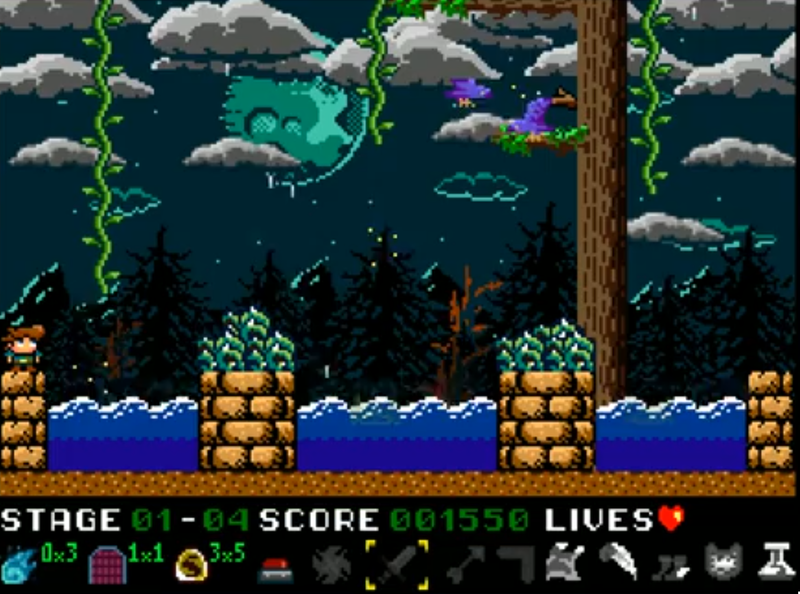 As the game is a puzzle platformer of sorts, you need to examine each screen carefully to identify your objective, usually a key, to be able to pass to the next screen. This can involve pushing or pulling graves to align them, or killing all the enemies. 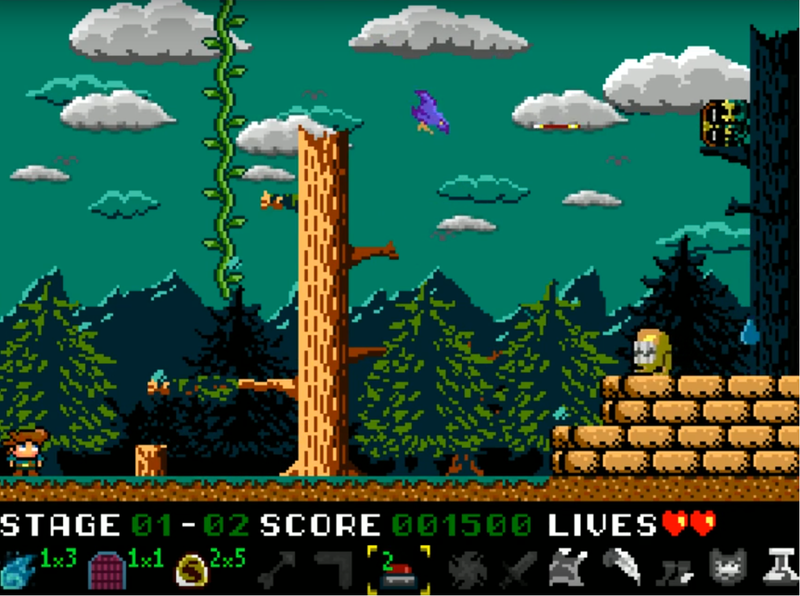 Of course the soundtrack is suitably retro, and captures the gothic feel of each stage well. Gameplay is as noted above, find the objective to grab a key to move to the next screen. Progress through each screen in a stage and finish the stage. Along the way will be special stones and weapons for Nogalious to use. These range from a sword, a boomerang, and even timed mines. Each of these works differently and can be cycled through, so finding the right one is key for each situation. Sometimes the way forward isn’t particularly clear, and this can come down to either the visuals, or the translation. The translation for Nogalious is odd in that while it gets the basics across, the language barrier proves difficult when explaining finer mechanics. With experimentation though it doesn’t take long to grasp. Nogalious himself is very easy to control, being able to attack, jump and pull or push objects. Oddly jump is assigned to pressing Up, but this is simply a matter of adjusting. You have fluid mid-air control, but be warned as some platforms are less solid than they appear. What do you see on this screen? Do you see a way to lower the water? 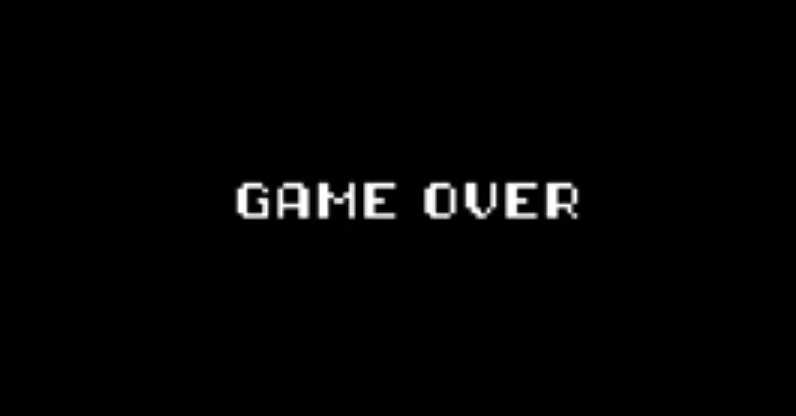 Trying to find the solution to a screen requires precise assessment of the pixel art. On the screen above you have a branch on a tree that will lower the water level and let you find the key to progress. Of course, this isn’t immediately obvious. Another problem with the above screen is the crows. Given Nogalious perishes in a single hit, and they can eat away at the respawning vines you need to climb and jump between, and contact damage is also fatal, care is required. There is a degree of randomness to this all. How much of the vine they chop away depends on where they land. Further, jumping between vines requires you to first jump and then move, making it feel more awkward than need be. The final issue is, unfortunately, overall difficulty. The challenge in each room can vary greatly, and your limited lives and fragility lead to using your limited continues at which point, well back to the start. This is a game about mastery, so a lot of trial and error will get you to the end. Nogalious is a fun game held back by its reference material. It’s still a great time, but the less patient gamers may find it a bit much. It’s fairly short, but the amount of (Mandatory) replaying will leave you chasing that high score if you are persistent. I recommend this quite easily to fans of classic challenging titles. Thanks for reading everyone, and don’t forget to share what you think of on social media or try it out for yourself on Steam. While you are here, check out our other Impressions pieces! Until next time, Happy Gaming! Previous NL Inklings Community: Our September 2018 Tournament Schedule!